calculus relative to the gingival margin. The objective of scaling is to remove calculus from the tooth surface. This is easy to accomplish when the calculus is located on the enamel of the tooth. Calculus attached to the root surface, however, is embedded in the surface irregularities and is much more difficult to remove. The dentist or hygienist will smooth out the irregularities and remove the calculus. As this is done, some root structure is removed. This is referred to as root planing. Several instruments have been designed for scaling and root planing. 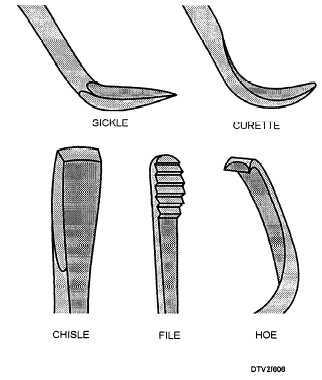 They include sickles, curettes, files, chisels, and hoes (illustrated in figure 6-6). We will discuss dental implant scaling instruments. Figure 6-7. - Sickle scaler. Figure 6-8. - Jacquette double-ended scaler. inserted under the ledge of calculus and used with a pull stroke. Figure 6-6. - Scaling and root planing instruments.